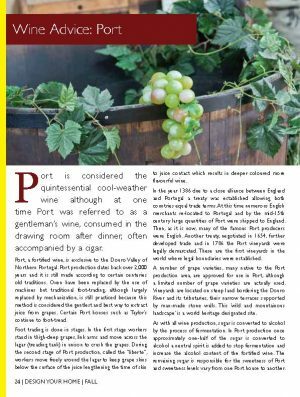 Port is considered the quintessential cool-weather wine although at one time Port was referred to as a gentleman’s wine, consumed in the drawing room after dinner, often accompanied by a cigar. Port, a fortified wine, is exclusive to the Douro Valley of Northern Portugal. Port production dates back over 2,000 years and it is still made according to certain centuries old traditions. Oxen have been replaced by the use of machines but traditional foot-trading, although largely replaced by mechanization, is still practiced because this method is considered the gentlest and best way to extract juice from grapes. Certain Port houses such as Taylor’s continue to foot-tread. Foot trading is done in stages. In the first stage workers stand in thigh-deep grapes, link arms and move across the lagar (treading tank) in unison to crush the grapes. During the second stage of Port production, called the “liberte”, workers move freely around the lagar to keep grape skins below the surface of the juice lengthening the time of skin to juice contact which results in deeper coloured more flavourful wine. In the year 1386 due to a close alliance between England and Portugal a treaty was established allowing both countries equal trade terms. At this time numerous English merchants re-located to Portugal and by the mid-15th century large quantities of Port were shipped to England. Then, as it is now, many of the famous Port producers were English. Another treaty, negotiated in 1654, further developed trade and in 1786 the Port vineyards were legally demarcated. These are the first vineyards in the world where legal boundaries were established. A number of grape varieties, many native to the Port production area, are approved for use in Port, although a limited number of grape varieties are actually used. Vineyards are located on steep land bordering the Douro River and its tributaries, their narrow terraces supported by man-made stone walls. This ‘wild and mountainous landscape’ is a world heritage designated site. As with all wine production, sugar is converted to alcohol by the process of fermentation. In Port production once approximately one-half of the sugar is converted to alcohol a neutral spirit is added to stop fermentation and increase the alcohol content of the fortified wine. The remaining sugar is responsible for the sweetness of Port and sweetness levels vary from one Port house to another. Once the fermentation process is complete, each wine is assessed and, at this time the style of wine is deter mined. Port is made in a variety of styles and this diversity is the main source of confusion amongst consumers. The final product is reflective of the length of time the Port is aged and the tanks or barrels in which it is aged. Port is divided in two main groups or categories – wood-aged Port and bottle-aged Port. Wood-aged Port includes White Port, Ruby Port, Reserve Port, Late-bottled Vintage Port and Tawny Port. Bottle-aged Port is Vintage Port and Crusted Port. It is bottle aged Port that requires decanting due to the sediment in the wine bottle . There are Ports to suit all tastes and food pairings although the most famous wine and food pairing is blue cheese or bittersweet chocolate served with Tawny Port. Port is no longer thought of as solely an after-dinner drink. Ports diversity of styles makes it a suitable wine pairing partner to serve alongside aperitifs and other food courses all the way to dessert.